Note: If the import is not completed in 30 seconds it will continue to run in the background and you willbe notified of the outcome by email. Only Inbox can be imported. With webmail, click on the Paddle lock so that is displayed. With Outlook (or any other email client), just type :: in the subject line. Note: Make sure that manually unlocked messages don’t contain any PHI. If you are composing a message to other MDofficeMail users, automatically is dispalyedindicating that the message is not encrypted. Unencrypted messages to MDofficeMail users are HIPAA compliant. 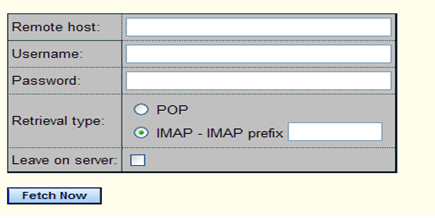 Messages between all domains hosted by MDofficeMail are not encrypted by default. You can manually unlock and send a plain (unencrypted) message to any recipient. You can add the email ids of family & friends so that unlocked messages are sent them by default. Using Webmail click “Compose” to compose and send a message. Messages are secure (by SSL) and encrypted by default, for end-to-end security. The indicates that the message is encrypted. All emails/ messages are by-default encryption activated. You can temporarily deactivate/disable encryption on outgoing messages in any mail application by including shorthand form "::" anywhere within the subject header. Also, if using our new Webmail (Web 2.0) interface, you can send outgoing encrypt messages by simply clicking the padlock in the upper left corner of the compose/reply window. You can deactivate MDVault temporarily on outgoing messages in any mail application by including shorthand form "::" anywhere within the subject header. Also, if using our new Webmail (Web 2.0) interface, you can send outgoing MDVault messages by simply clicking the padlock in the upper left corner of the compose/reply window. You can add an email id in your contacts, friends list so messages to them is send plain always. Messages to this address will be plain (unencrypted) by default from here-on. You can revert this configuration by following above steps and select “Lock this Recipient” instead of “Unlock Recipient”. NOTE: Please make sure that you will not be sending ePHI to this address. In the upper left corner, clicking the paddle-lock closed will force encryption. Alternatively, you could open the message options by clicking 'options' on the right side just after 'Toggle cc / bcc /' and then selecting 'MDVault/SurgeVault' under the Encrypt drop-down menu. Doing it this way also allows you to save and retain the Encrypt setting for future emails so you won't have to keep enabling it. Set the Retain options checkbox to save the settings. Please note that the state of the paddle-lock when composing new mail is not dependent in any way on encryption rules defined on the server. This setting only forces encryption. Rules setup by the administrator might otherwise force it no matter the condition of the paddle-lock. Contact the server administrator for more information on configuring server-side MDVault rules. With SSL/TLS encryption technologies, mails sent to and from your domain, or any address locally hosted by MDofficeMail, always remain secure without the need for additional software or certificates. However once email leaves our servers to an outside address, it becomes like any other message. To keep it secure, we present MDVault, an innovative new method for encrypting and delivering email securely over the internet, without the need for installing additional software, certificates or keys. You have sent an encrypted message and recipient of that message hasn’t viewed it yet. Click on “ ” tab on the left side. Click on “delete” against the message that you want to expire. Unless you have an MDofficeMail account, you can only use MDVault to respond securely to an address hosted by MDofficeMail, either through an MDVault notification sent to you. Only MDofficeMail accounts can initiate encrypted messages directly within their mail client. If you have your own domain, you can move your domain mail accounts over to MDofficeMail to gain full MDVault functionality or use a sub-domain for this purpose, e.g. username@yourdomain.mdofficemail.com. A domain transfer, i.e. registrar transfer, is not required and you can keep your website hosted where it is. A Domain-Hosted Plan is required to use your own domain or sub-domain with MDofficeMail and our support team can assist in setting this up for you. There are three different methods of search messages within webmail. The method is changed by clicking the magnifying glass in the search field or as explained below. Note: This will not search message bodies or other pages of messages in the currently displayed folder (see hint below). email: joe@domain All messages with 'joe@domain' in any of the recipient fields ie. a "conversation history"
subject: webmail All messages with 'webmail' in the subject ie. a "thread view"
Without password retrieval Q&A, it will be difficult to retrieve forgotten password. To configure this, please login to webmail go to Options > Preferences > Change Password. You can add your Question and Answer in this window. From the same window you can change your password.